Flixbus, the European bus and coach operator, is to begin trials of an electric bus on long-distance routes in France and Germany. In April the first Flix-E bus will begin testing on the Paris to Amiens route, and in the Summer the second bus will operate on the Hessen to Baden-Württemberg route, which is traditionally part of the expanded operations for holidaymakers. 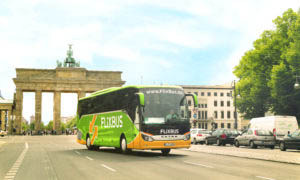 In addition to its Flix-E bus programme, FlixMobility is preparing to launch FlixBus USA in Los Angeles this Spring and will launch its long-distance green train in Germany this month.